In case you missed it, itch.io just launched a revamped bundle system just a few weeks ago, check it out: Introducing Co-op Bundles. A few other changes also snuck out, but now we’re officially announcing them. 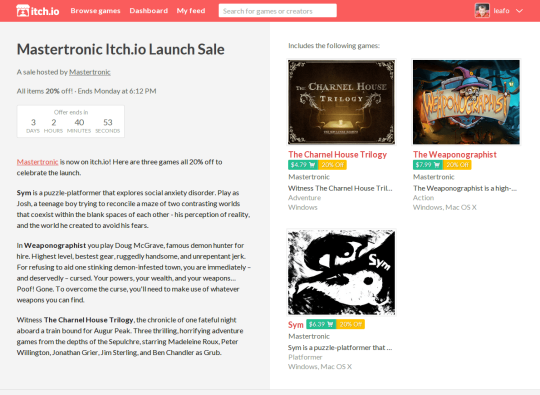 All sale pages on itch.io now have a new design! The new page puts the games in the sale closer to the top with a two column layout. There’s a new countdown widget to help any viewer know exactly how much time is left. The updated page is also responsive, so it works well on wide screens and mobile devices. Browse all active game sales on itch.io. If you weren’t already aware, anyone can host a sale on itch.io whenever they want! Learn more about sales.